Hello! 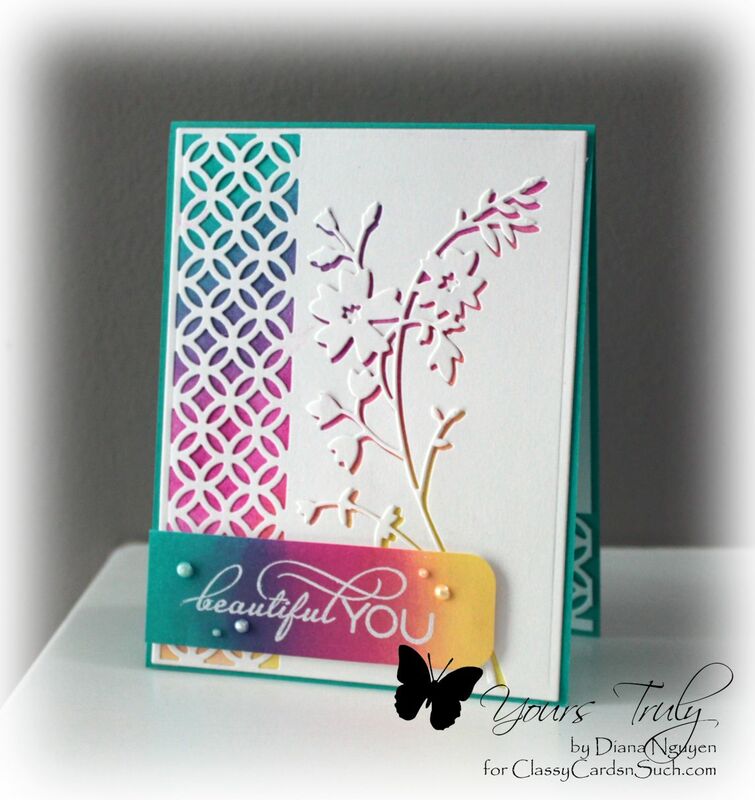 Diana here to share with you a card I made with some fun summer colors for this week's Colors and Patterns challenge. I started with 2 sheets of white card stock trimmed with the largest rectangle die from Spellbinders A2 Matting Basics A. On one of them, I sponged in a diagonal direction Tim Holtz Peacock Feathers, Picked Raspberry, and then Squeezed Lemonade. I love how those colors blended together makes such a wonderful array of colors. From the second piece of the white rectangle, I die cut out a Fancy Border Cutout by Impression Obsession and also the Memory Box Honey Blossom Sprig. I then adhered that sheet with all the negative cuts on it to the sponged layer. After that was done, I glued back the white honey blossom sprig - slightly offsetting it so that the sponged layer would show up as a shadow. I also sponged another strip with the same colors to add a banner using some Verve stamps and white detail embossing powder. For a final touch, I added some pearl dots using the ice white Viva Decor Pearl Pen. 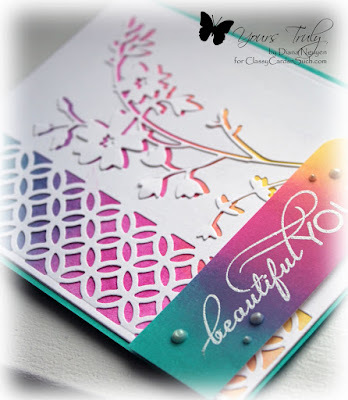 For the inside of the card, I also used the Fancy Cutout Border die along the bottom edge. Thanks for looking and I hope you find some time to play along! Beautiful card, I love the way distress inks blend and you picked some of my favourite colours too. Wonderful layout.